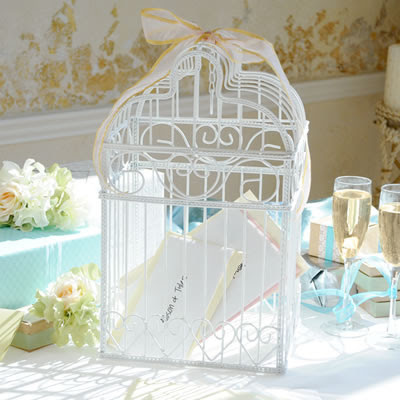 Many brides position their gift tables right at the entrance to the room for the convenience of guests. This is not a good idea because it makes the gift table an easy target for a thief. Instead, place the gift table in a corner, away from any doors (including restroom doors). This makes it more difficult for a thief to take something from the table and make an undetected escape. 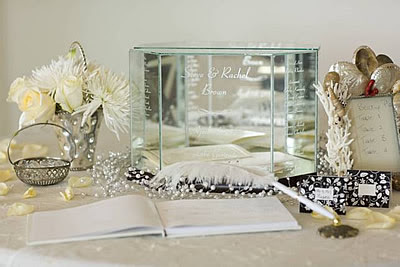 As you are deciding who to include in your wedding party, be sure to select someone to be in charge of the gift table. The person you select should not be a member of your bridal party. Instead, it should be a responsible individual who's attention won't be distracted by other activities at the wedding reception. Let the person know that you selected them because it's a critically important job. He/she may not even be aware that wedding gift theft is an issue, so be sure to educate them. After all guests have arrived and placed their gifts on the table, the person in charge of the gift table can then take all the gifts (with the help of others) to a secure location. This can be the bride/groom suite, or the trunk of a family vehicle. Some hotels may offer secure locations, as well, but be certain you can trust the hotel employees before opting for this. Believe it or not, proper wedding guest etiquette states that guests should not bring gifts to the wedding. Instead, they are supposed to send them in advance of the wedding. Most people are unaware of this, however. 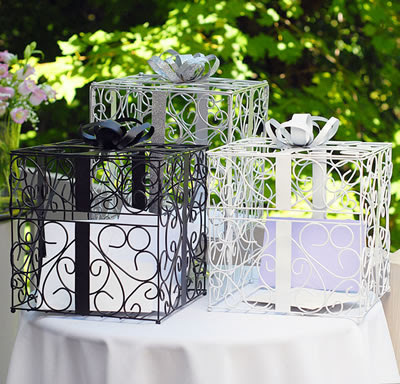 Creating an online wedding gift registry can help minimize the gifts that are brought to the reception. 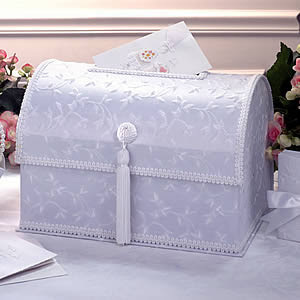 When the gift is purchased from the registry, the buyer will have the option to ship the gift directly to the address specified by the bride and groom. Many guests will be bring a card with cash or gift cards enclosed instead of a wrapped gift. These cards are what wedding thieves go for first since they are easy to grab and hide. 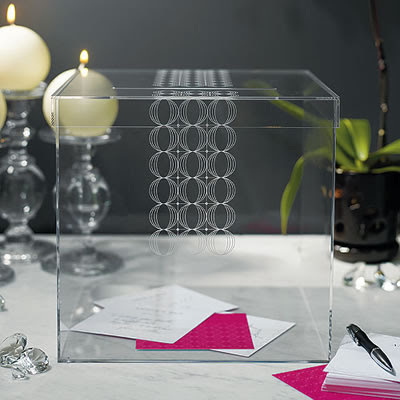 You can deter this by using a wedding gift card holder on the table so that all cards are secured in a large decorative box that can't leave the room easily without being detected. 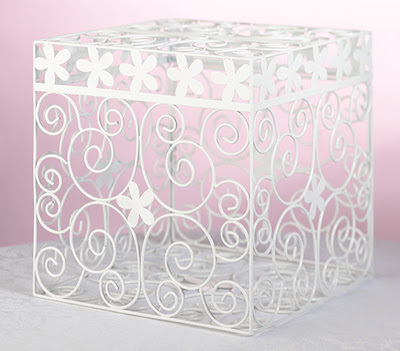 Wedding gift card holders come in all shapes and styles, many of which can be used after the wedding as decorative items in your home seasonally or year round. 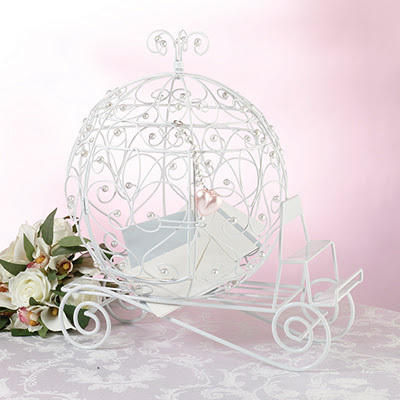 Some of our favorites are shown below ... all are available at WhereBridesGo.com. As sad as it is, wedding gift theft is a common problem. By taking just a few proactive steps, you can minimized your risk of becoming a victim of this heartless crime. 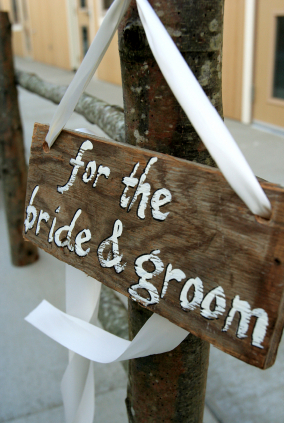 The last thing you should have to worry about at your wedding is the gift table ... so relax and enjoy your big day! 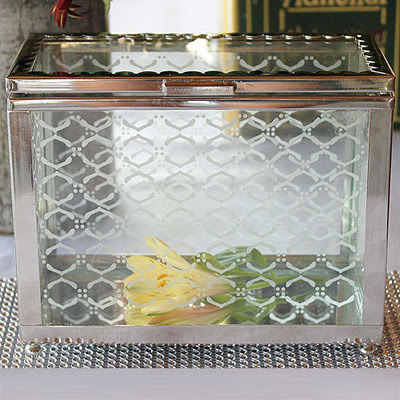 For more gift ideas, wedding favors and accessories, check out WhereBridesGo.com! That is such a horrible thing to do to someone as they embark on their new lives together. This article has definitely reminded me of some points to remember when working with my couples. Thank for such a wonderful article.